The Quicksort algorithm is one of the very popular sorting algorithms in programming, often used to sort a large array of numbers. Though there is numerous algorithm available to sort a list of objects, including integer, string and floating point number, quicksort is best for general purpose. It's a divide and conquers algorithm, where we divide the given array with respect to a particular element, known as 'pivot' such that the lower partition of the array are less than the pivot and upper partition elements of the array are higher than the pivot. 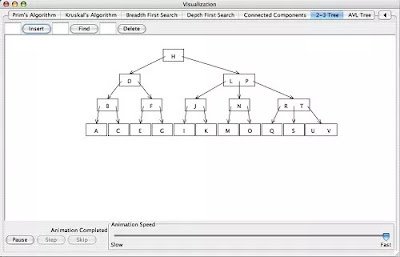 The Quicksort is also one of the best examples of recursion, a key programming technique to solve Algorithmic problems. This algorithm is naturally recursive because it sorts the large list by dividing into smaller sub-list and then applying the same algorithm on those. The base case of recursion is when a list contains either one or zero elements, in that case, they are already sorted. Quicksort is well ahead with primitive sorting algorithms like Insertion sort, selection sort, and Bubble sort. The average time complexity of quicksort is O(nlogn), while in the worst case it's performance is similar to bubble sort, I mean O(n^2). Apparently, the worst case of quicksort is the best case of insertion sort, where they have to sort an already sorted list. In this article, we will learn how to implement quicksort algorithm in Java using recursion. We will also learn how quicksort works, and how it sorts a large list of unsorted number. In the last section, we will revisit some important things about quicksort. Btw, if you are new into Data Structure and Algorithm field and not familiar with essential searching and sorting algorithms like Quicksort, I suggest you take a look at the Data Structures and Algorithms: Deep Dive Using Java course on Udemy. One of the better course to master algorithms and data structure in quick time. An old saying is, a picture is worth more than a thousand words. This is completely true in case of understanding how sorting algorithm works. In the past, I have understood Insertion sort, Bubble sort, and Radix sort much better by following a diagram rather than reading about it. 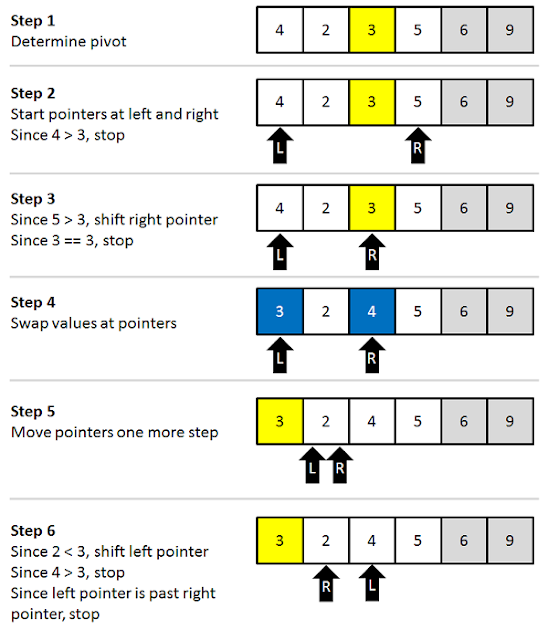 That's why I am sharing this diagram which explains how quicksort algorithm works, how it sort a list of integers. It's similar to flowchart but doesn't use the notation flowchart uses, instead it practically shows how sorting happens. Once you go through this diagram, read the explanation, it will make more sense. As I told before QuickSort is a recursive algorithm, it divides the big list into smaller list around pivot until those lists are individually sorted. The first step of the Quicksort algorithm is to determine pivot, it's general practice to choose the middle element of the array as a pivot, but you are free to choose any index. Now you have two lists, the next step is to ensure that left partition only contains numbers less than the pivot and right partition only contains numbers greater than the pivot. We start pointer from left and right of the pivot, and as soon as left pointer encounter 4, it stops because 4 is greater than 3. Similarly, the right pointer stops at 3 because all numbers on the right side of the list are greater than 3. Now it's time to swap, so 3 takes place of 4 and vice-versa. Now, we move the pointer to one more step, since 2 > 3, left pointer shifts but since 4 > 3, it stopped. Since the left point is also past right pointer it stopped. Now if we repeat this process one more time, the list will be sorted. If you still don't get the algorithm then I suggest you join the Visualizing Data Structures and Algorithms in Java course on Udemy. A special course which will teach you data structures and algorithms in Java through animations and implementations. Though we often select a middle element of the array as a pivot, there is no such there is no such rule and pivot can be an element of the given array. You can even consider the first element as the pivot in every partition. It's experienced that choice of pivot effects the distribution of the elements in partitioning and affects the complexity of the quicksort algorithm. As per rule of partition, numbers in lower partition should be less than the pivot and upper partition numbers should be higher than the pivot. Running time of partition logic is linear. 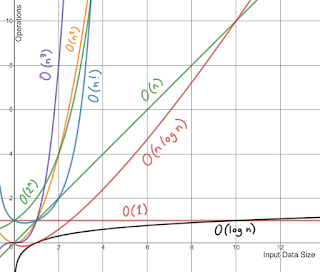 On an average Quicksort Algorithm has the complexity of O(NlogN) and in the worst case, it has O(n²) when the elements of the input array are already sorted in ascending or descending order. The good thing about Quicksort is that it's an in-place algorithm, which means it does not take any additional space, except those used by method stack. By the way, there are some tricks to improve the performance of quicksort, even in the worst case. As suggested in one of the best algorithm design book, The Algorithm Design Manual, from Steven Skiena, you can apply the following the recommendation to improve your quicksort algorithm implementation. There is a drawback of using recursion to implement quicksort algorithm, It will not scale because JVM has no tail call optimization, it will simply grow the method call stack to something proportional to the array to sort, and it will fail for the very large array. Btw, if you have trouble understanding how we calculate time and space complexity of an algorithm or solution, I suggest you check out Algorithms and Data Structures - Part 1 and 2, a two-part series in Pluralsight to learn how to calculate time complexity. It's an excellent course for beginners. Here is our recursive implementation of QuickSort sorting algorithm. We have used it to sort an array of randomly distributed integers. We have two set of input, one which doesn't contain any repeated number and other which contains duplicates. The Logic of quicksort is encapsulated in method recursiveQuickSort(int array, int startIdx, int endIdx) and partition(int array, int left, int right), which implements partitioning logic. In order to hide implementation details, we have only exposed a convenient static utility method called quickSort(int array), which takes an integer array and sort that in-place. * Java program to Sort integer array using QuickSort algorithm using recursion. * and then recursively sorts each list. * Pivot while right side contains elements greater than pivot. As I said, QuickSort is one of the most popular sorting algorithms between programmers, maybe just next to Bubble sort, which is ironically worst algorithm to sort a large list of numbers. But one thing is common between QuickSort and Bubble Sort, do you know what? In the worst case, both have the complexity of O(n^2). 1) QuickSort is a divide and conquer algorithm, which means it sort a large array of numbers by dividing them into a smaller array and then individually sorting them (conquer). 2) Average case complexity of Quicksort is O(n log(n)) and the worst case complexity of Quicksort is O(n²). 3) Quicksort is a comparison sort and, inefficient implementations, it's not a stable sort, which means equal numbers may not retain their original position after sorting. 4) Quicksort algorithm can be implemented in-place, which means no additional space will be required. This makes it suitable to sort a large array of numbers. 5) Arrays.sort() method in Java uses quicksort to sort an array of primitives like an array of integers or float and uses Mergesort to sot objects like an array of String. That's all about how to implement a QuickSort algorithm in Java. QuickSort is one of the fast and efficient sorting algorithm, perfect for sorting large arrays, but some programmer finds it extremely hard to understand. One reason for this could be that because quicksort is in-place algorithm due to which programmers find it bit confusing, but it's very efficient. Otherwise, if you choose simplicity you can always implement it in other ways. please post more sorting tutorials. Quicksort is slightly sensitive to input that happens to be in the right order, in which case it can skip some swaps. Mergesort doesn't have any such optimizations, which also makes Quicksort a bit faster compared to Mergesort. What is the benefit of Quicksort algorithm over other O(logN) algorithms e.g. mergesort, heapsort, or shellsort? Apart from in-place sorting (mergesort needs one more collection) I don't see any other benefit of using QuickSort. On the other hand there is a drawback of QuickSort that it's not a stable algorithm, which means same elements will lose their original position after sorting, which doesn't happen on mergesort. Unfortunately this is not obvious when you read any explanatio of how quicksort works, it's hidden and mostly overlookded. Why do you want to learn bubble sort? Go try to learn heapsort, or bucket sort, there is no benefit of learning buble sort dude. The algorithm fails if you have more than half array as duplicates. E.g. You mean quicksort algoirthm cannot handle duplicates if they are more than half of the array or is there a bug here?